Contact Roxio Support through the website here and see what they have to say about it. Let us know what you find out. I was getting the same screen as you showed. I looked for updates and found 2. Installed them and it fixed the page you showed and I was able to use it. Only problem is when I try to edit a video. I click on "add photo/video" and a timer comes up for a couple seconds and the program closes. What the heck is going on now. I am running windows 10 and currently updated. My Roxio 6 is also updated so I have no clue what is causing this to happen. Please post the Windows dxdiag.exe text file so we can see what you are using and if there are any error messages. Did you have your antivirus active during the installation? What kind of video file are you trying to add (format) and what camera did you use to take the video. 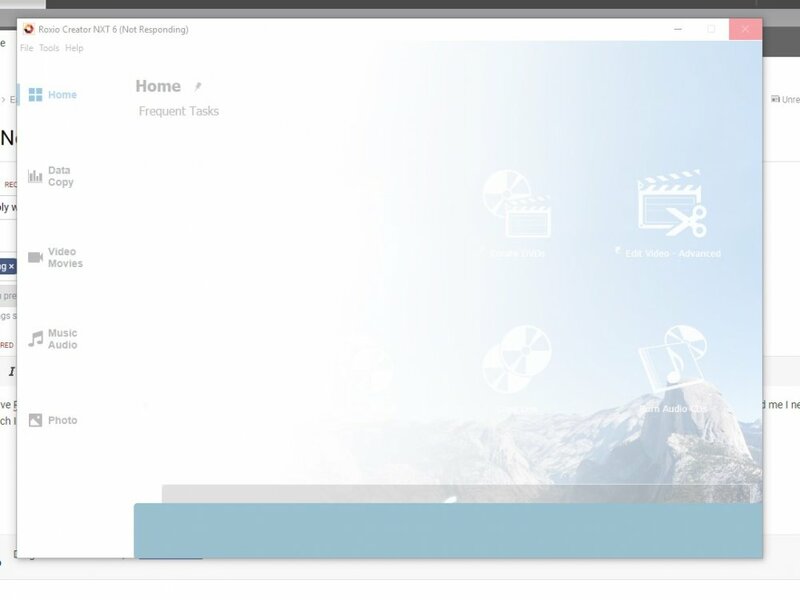 Did you transfer the video to a folder on your computer's hard drive? Thanks, heads up. Since I posted this i contacted roxio and they had me reinstall. They first had me erase all roxio on my laptop. I then shut off my anti virus and reinstalled roxio. It has worked great till this morning. I go to "Edit Video- Advanced". I then click on "add photo/video" and a timer comes up for a few seconds and my screen disappears. Not quite clear on what happens. Does the "timer" appear as soon as you click "add photo/video" (the selection folder does not appear) or you select a photo/video and then the timer appears? Yes the timer appears after clicking on "add photo/video" . After posting this i restored my computer to 7 days ago and it is all working fine now but rest assured it will likely happen again. Any clues what to do when it does? I have had this happen with older versions and what I do is instead of 'add photo/video' use Windows Explorer to drag/drop the file into the program. My Windows 10 with NXT 6 has not been doing this. I know why it's closing. Same happened to me and I found a work around.